The Portland Thorns earned three points at home as they defeated the Utah Royals in a Friday night matchup. 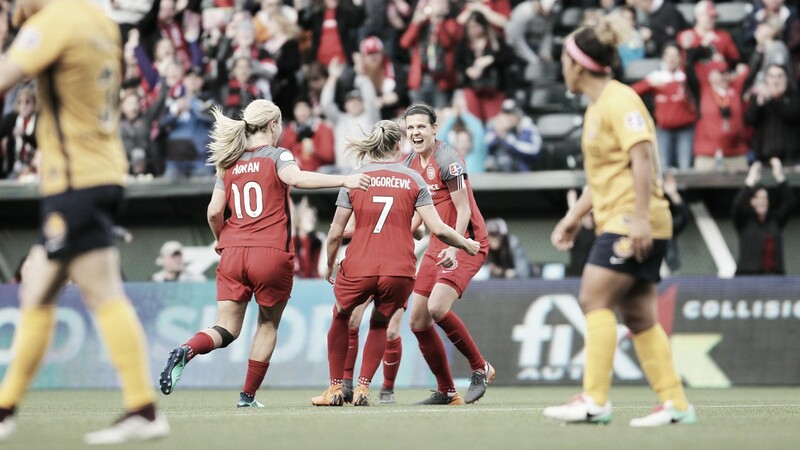 Portland Thorns FC: Eckerstrom; Klingenberg, Menges, Reynolds, Purce; Horan, Andressa (Salem, min. 58); Heath, Sinclair, Carpenter (Hubly, min. 63); Crnogorcevic (Onumonu, min. 83). SCORE: 1-0, min. 18, Sinclair. 2-0, min. 39, Horan. REFEREE: Horan (min. 67), Corsie (min. 69), Jónsdóttir (min. 83). 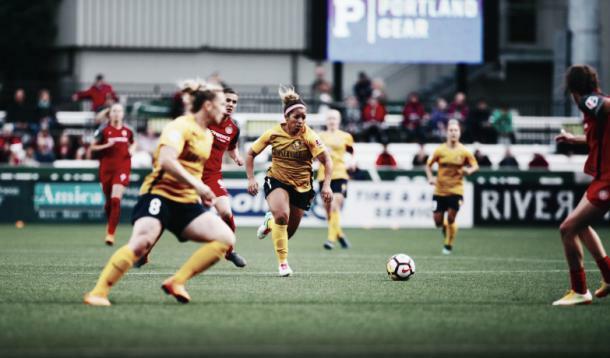 The Utah Royals saw their four-game unbeaten streak come to an end after the Portland Thorns beat the league’s newest team 2-0. Thorns head coach Mark Parsons also became the third NWSL coach to earn 50 wins joining Seattle Reign Coach Vlatko Andonovski and Royals coach Laura Harvey. Christine Sinclair scored her sixth goal of the season, leading the golden-boot race. Lindsey Horan doubled the lead with her fourth goal of the season. Offensive possession for the match was even with Utah with slight 51% to 49% edge. Both squads were even on shots with eight each, but the Thorns lead shots on goal 5-3. They also lead the lopsided statistics of corners with seven to the Royals’ one and crosses with 23 as opposed to nine. The Thorns went up 1-0 early in the first half thanks to their captain Sinclair. Tobin Heath sent a through ball to Sinclair at the edge of the box who dribbled around her defender and took a shot. The ball hit the inside of the left post and went in, past the diving arms of Utah goalkeeper Abby Smith. The 18th minute goal is Sinclair’s sixth of the season giving her a two-goal cushion for the golden boot. It is also Sinclair’s 37th overall, giving her the third-most in league history behind Sam Kerr and Jessica McDonald. Portland’s lead doubled about twenty minutes later in the 39th minute courtesy of Horan. Meghan Klingenberg dribbled up the left flank and sent a cross into the box to Horan who struck it with her knee into the back of the net for the 2-0 lead. The goal is Horan’s fourth of the season 14th overall in her three seasons. The Thorns had another chance to score in the first half before the second goal. Again, Sinclair was responsible for the two shots that forced saves from both Smith and Utah defender Becky Sauerbrunn. Sinclair’s short-range shot was blocked by Smith and Sinclair’s rebound shot was saved by Sauerbrunn who used her face to block the shot. Portland had an equally impressive save in the 44th minute courtesy of Klingenberg. Erika Tymrak sent a pass in the box to Amy Rodriguez who sent the ball towards the net, but Klingenberg was there to make the goal-line save to keep the match 2-0 before the end of the half. The only chance in the second half that was promising was in the 90th minute, against from Sinclair, whose shot from outside of the box was blocked by the crossbar. The match did mark a few milestones for players. Rodriguez played her first 90-minute match for the first time since returning from an ACL tear that sidelined her in 2017. The match was also the second-straight shutout for both the Thorns and for goalkeeper Britt Eckerstrom who has started in place of Adrianna Franch who is out with a knee injury. Portland will stay at home to host the first-place North Carolina Courage on Wednesday May 30with kickoff scheduled for 7:30 p.m. PT. Utah will travel east to take on the winless Sky Blue FC on June 2 with kickoff for that match scheduled for 7:00 p.m. ET. Both matches will be streamed live on go90.com and the go90 app which is available for iOS and Android devices.